America's newest vintage trolley opened on July 19, 2003, after four years of planning and construction. About 500 people turned out at the 6th St. Station for the gala dedication ceremony, dubbed the "Red Car Revival", including officials of the Port of Los Angeles as well as two Los Angeles city councilpersons and two state senators. At the end of the ceremony, the Waterfront Red Car Line was officially opened to the public. The crowd remained heavy throughout the day, with a long line extending off the 6th St. Station platform until late in the afternoon. Waiting passengers were serenaded by a brass band, and treated to free popcorn and complimentary Red Car ephemera. About 2,000 free tickets were handed out, and it's estimated that an even greater number actually climbed aboard to ride before operations ended at 6 pm. The 1.5-mile Red Car Line connects the Los Angeles cruise ship terminal with other attractions along the San Pedro waterfront. The $10 million dollar project was financed and constructed by the Port of Los Angeles, the independent City agency that manages the bustling port facility. Groundbreaking for the first station took place in July 2000, and within a year, the stations and overhead wire were in place, and the track and grade crossing upgrades had been completed. The line uses parts of an old PE right-of-way that continued to be used for freight operation long after passenger service ended. The line was rebuilt to accommodate trolley operations with traditional 600-volt DC overhead trolley wire, supported with simple wooden line poles. The four stations have a simple wooden shelter on top of a high-level concrete platform. Although this creates some unusual challenges with cars that are different widths, it does make boarding and alighting easier for everyone, and all three cars can accommodate wheelchairs. Freight operations also continue over the same tracks, although segregated into a night-time running slot, with derails and other physical barriers in place during the day while the trolleys are running. In order to maintain the necessary clearance for the freight trains, each platform is equipped with a pair of boarding ramps that are kept lowered during the day, and raised up at night. The line's most distinctive feature is its unique railcars. 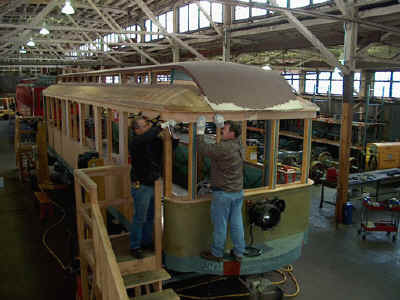 Regular operation will be conducted with two new replica railcars and a restored original PE car. Service has begun with one of the replica cars, (501) and the restored car (1058). The second replica car will be completed later this summer and will then take the place of car 1058 in the regular lineup. 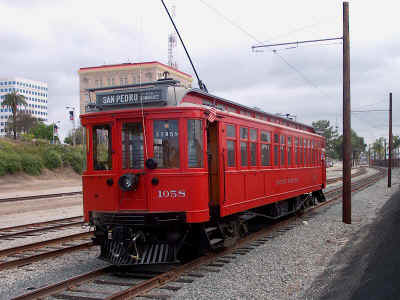 Car 1058 is a unique piece of Southern California history, with a special tie-in to San Pedro. Built in 1913, the 1000-class, or "Tens", were the biggest wooden cars to run on the PE, as well as the last wooden cars built for the railway. 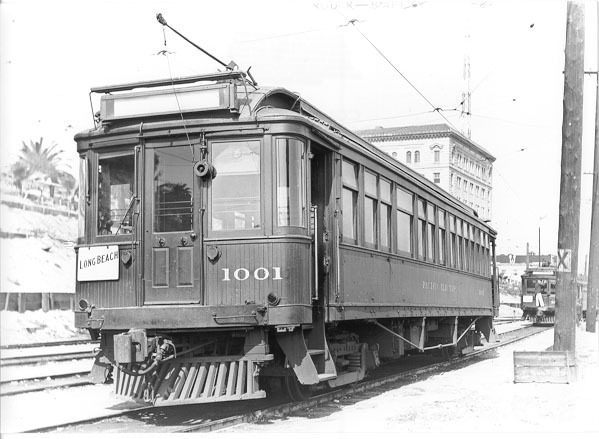 The Tens were withdrawn from service in 1950, coinciding with the closing of the Venice Short Line. Only cars 1000 and 1001 survived the scrap heap, and both are now at the Orange Empire Railway Museum (OERM) in Perris, California. Car 1058 was actually created from the damaged remains of PE 950-class car number 963 in 1960-63. ..... and car 1058 is seen on roughly the same spot in 2002. That's the San Pedro City Hall Building in the background of both views. The transformation into the car we now call 1058 was the work of the late Richard Fellows. A San Pedro resident, Richard worked in the family boat building business, Fellows & Stewart Inc., located on Terminal Island in the LA Harbor. As the PE was ending passenger operations, Richard conceived of operating a group of PE cars for the public's enjoyment using rubber tires and gasoline engines instead of railroad running gear. His location on Terminal Island was right next to the infamous National Metals scrapyard that became the final stop for hundreds of streetcars and interurbans that once served Los Angeles. He ultimately purchased six Pacific Electric carbodies, retaining four for his own collection. Car 1058 was to be the first of four rubber-tired Red Cars. It underwent a complete rebuilding in 1960-63; in order to faithfully reproduce the appearance of a "Ten", it was stretched by the length of three windows, had two entirely new ends built, and received an entirely new mahogany interior. The finished carbody was mounted on a pair of dual-axle rubber-tired bogies, the front set being steerable. Richard's ingenuity and attention to detail extended to the car's control system. The cab was outfitted almost exactly as it had been in service, only with new functions for the control hardware- the controller became the steering wheel, (turning the controller handle is what turned the wheels! ), the deadman pedal became an automotive-type accelerator, and a traditional motorman's brake valve and air gauges were installed to run the air brake system. Richard Fellows' rubber-tired 1058 was built in the early 1960s from the remains of the damaged carbody of PE 963. It is seen here making an appearance in the 1999 San Pedro Christmas Parade. Following its debut in 1963, the 1058 appeared in numerous local parades, movies (including "Who Framed Roger Rabbit"), and civic events. When Richard passed away unexpectedly in 1995, his Red Cars and other collections were auctioned off, although through a complicated series of events, car 1058 was not sold. Offered on the open market for several years, it was ultimately purchased by the Port for $80,000, for which price they became the proud owners of a beautifully restored carbody ready to be reunited with railroad running gear. Following its arrival on Port property in 1999, car 1058 was initially kept on its rubber tires, even appearing in San Pedro's annual Christmas Parade. 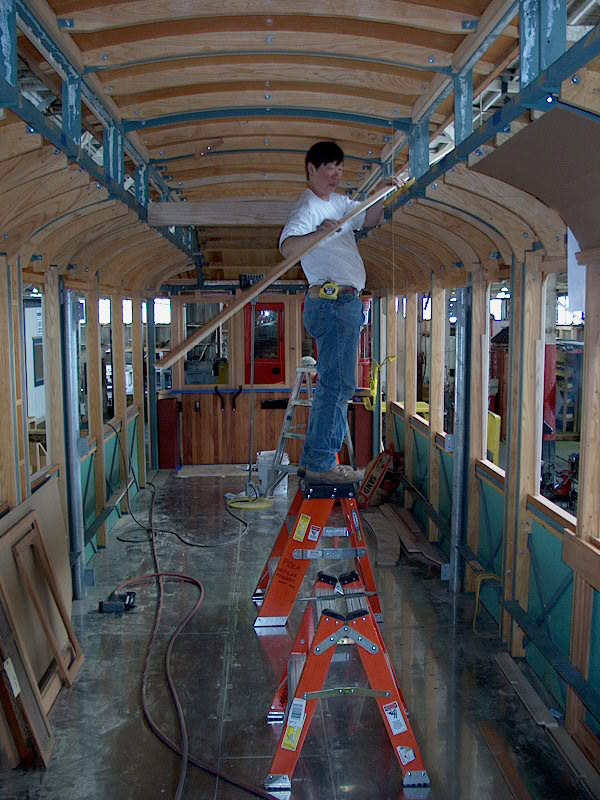 Work began on the car's conversion in the spring of 2000, after the purchase of trucks and motors from the Seashore Trolley Museum. Remarkably, Seashore was in a position to sell a pair of Japanese-built Baldwin interurban trucks that were reasonably close to the type a "Ten" would originally have been equipped with. The trucks had come from a retired Japanese work motor, and were in generally good condition. Design of the electrical and airbrake system for the car took place concurrently with the design of these same systems on the two replica cars that were about to be built. With some minor differences, the three cars in the Port's "fleet" would thus have the same major airbrake and electrical control components. The mechanical conversion of car 1058 back into a railcar was undertaken by Roger Fuerhing and his company F&M Locomotive. In addition to the work performed by F&M, Port crews repainted the exterior of the car, painted the floor and ceiling, and built and installed new wooden walkover seats. The work took place in an old Port warehouse in Wilmington, adjacent to a former PE rail line and not far from where 1058 had been crafted by Richard Fellows and his crew almost forty years earlier. The car was actually driven into the warehouse on its own wheels, barely squeezing in after letting all of the air out of the tires. Although much of the work on the car was complete by September 2001, delays in getting the line's maintenance building built prevented it from being moved to the Red Car Line for testing. It was not until June of 2002 that car 1058 was finally placed on the rails. Fittingly, it returned to the rails on former PE trackage, being towed around the harbor on the old PE "West Basin" line. In lieu of a maintenance building, a temporary solution in the form of a large tent structure was erected as on the spur leading up to the building site. On June 23, 2000, the trolley pole was placed on the wire and 1058 took its first baby steps. The Waterfront Red Car Line had come to life! Testing and shakedown of the car proceeded over the next few months and the "temporary" maintenance facility was enhanced with the construction of an inspection pit. The odyssey of the replica cars is indeed an interesting one. Having been partially completed by a contractor in the Pacific Northwest during 2000-2001, they came to the Port in October of 2001 in kit form. While car 501 had its roof and most of its exterior wood in place, car 500 was only a steel frame with some wooden nailers attached. The cars were completed by the Port's own crews over the next eighteen-plus months, with your author and Dave Garcia serving as consultants. Replica car 501 was completed by Port of Los Angeles personnel in 2003, and wears the dark red paint scheme that the PE 500s wore in the 1910's. Gone from the roster in 1934, the 500's never wore the lighter red that the cars received beginning in the early 1940s. The replicas are patterned on surviving PE car 538 at Orange Empire. The process began in 1999 with a detailed survey of the original car, at which time a set of CAD drawings was also begun. The car's visual character was analyzed, prioritizing the most significant elements for reproduction. While traditional running gear and the attendant sounds of traction motors and gears was deemed a desirable feature, the goal of minimal maintenance was also introduced. This laid the foundation for a car that would use refurbished "vintage" running gear but would have an airbrake and electrical system built entirely from current, off-the-shelf components. Port carpenters had access to original components loaned by OERM, such as this interior window post panel. The replicated panel appears at left. For reasons of practicality and safety, the replica cars would also have a steel subframe. Using the CAD drawings based on car 538, the contractor was able to lay out the steel frame in a manner that would allow the wooden superstructure to be crafted, to the extent practical, into a dimensionally accurate replica. Some compromise was inevitable, particularly with regard to the width of some of the window posts, but all in all, the classic proportions of the original came through quite nicely. 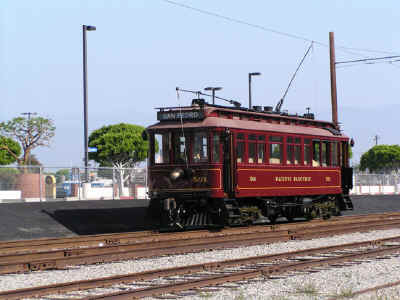 The design elements that define these distinctively Southern California interurban cars are all there- the unique grouping and archways of the side windows in the closed section, the open-air section, and the five-window end, complete with curved corner windows. 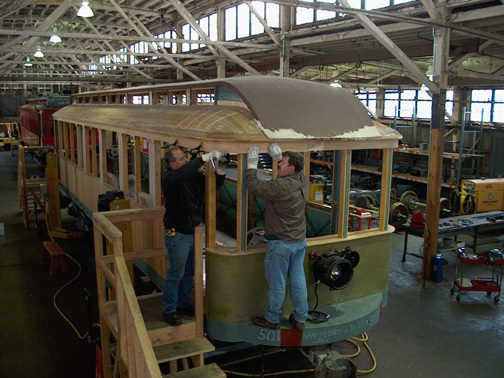 Port carpenters apply a piece of steam-bent exterior trim to car 501's letterboard in March 2002.
engineering analysis to confirm that the trucks would not beat themselves to death under the expected weight of the completed carbody. An entirely new airbrake system was designed by Dave Garcia. It's an automatic air system, using current Wabco 26 type components. Each car has a pneumatic deadman function (utilizing a footpedal), as well as a conductor's valve. There is also a low-air alarm, and either a low-air condition or an emergency application (such as a penalty application from the deadman) automatically knocks out propulsion power. Sanders are also provided. Dave Garcia also suggested the source for the control equipment, namely Goodman Equipment. Goodman was an old-line builder of mining locomotives, and they proved to be an excellent partner for the development of a new electrical system for an antique vehicle. Goodman adopted one of their magnetic contactor control designs to suit the needs of the Port's three cars. The control circuits are all 36-volts from an on-board low-voltage power supply. This means the operator's controller , the onboard lighting and other equipment in the passenger compartment are all using low-voltage, keeping the 600 volts and heavy currents under the car. Acceleration is manually controlled by the operator. The propulsion circuits are protected with simple overload relays, and a roof fuse offers some additional protection in the event of a catastrophic electrical problem. The resultant system functions just like the classic GE Type M control found on interurban and rapid transit cars throughout the world, but is built with all new components. As icing on the cake, one of Goodman's older designs of master controller proved to have just the right look for the cab area, complete with a cast brass top. By May 2002, the framing inside car 501 was nearing completion. Visible in this view is the car's plymetal floor (a stainless steel/plywood sandwich) and the steel subframe around which the wooden carbody was constructed. As completion of the replicas progressed in Wilmington, the CAD drawings were continually updated, providing a source for shop drawings and other dimensional data. Using a combination of photographs, drawings, and original components borrowed from OERM, the Port's carpenters faithfully reproduced the interior in mahogany, finished with a subtle stain and about 15 coats of varnish. The original moldings and decorative elements were each reproduced, accented by brass hardware on the doors and ceiling. The correct color amber glass was located for the clerestory windows, and a combination of gold leaf and painted lettering adorns the bulkheads. Finished interior of replica 501 retains the look and feel of the original 500's. Wooden walkover seats, created by reverse-engineering a Los Angeles Railway seat from OERM, provide accommodations for 46 passengers. The floor is covered with a simple black rubber transit flooring, laid directly on top of the plymetal subfloor. While a wooden floor could have been utilized, a plymetal floor is common practice in modern transit cars, in part because it provides an excellent fire barrier. The floor was also deemed to be an area with minimal visual impact, and it also met the aforementioned goal of lowest practical maintenance. With the use of modern control equipment, the cab areas at each end appear quite different than the original PE 500s, although the controls are located in essentially the same locations. ....and the scene was recreated with car 501 on the occasion of the line's first charter operation. The car was chartered by the Cranberry Tarts, whose red hats and feather boas provided just the right look. The hand-lettered "Pacific Electric" on the car sides, along with the car numbers and decorative striping add a nice finishing touch, and the reproduction PE air whistles provide the perfect E-flat tone the Red Cars were known for. Car 501 was trucked out of the warehouse on April 24, 2003 and trucked over to the San Pedro side of the harbor where it was unloaded adjacent to the Red Car Line trackage. Testing of the car began almost immediately, followed by operator training in advance of the big July opening. Five years ago, none of us here in Los Angeles would have believed that a PE-themed vintage trolley line would be constructed, let alone two 500-class replica cars! Its heartening to see this kind of interest in the Pacific Electric and its role in the history of Los Angeles. Having been gone more than 40 years, the PE is rapidly disappearing from living memory, and projects such as this one will help keep interest in the subject alive for future generations. The replica cars themselves have also broken new ground, both in terms of their sheer size (43 feet in length and 58,500 lbs) and in their accurately detailed appearance. Everyone loves historical accuracy, until they find out how much it costs! In this case, the customer was willing to devote the resources to achieve that extra degree of accuracy in the areas where it would pay off most effectively, and the devotion of the craftsman who built them is obvious in the final product. Cars 500 and 501 will surely go on to long careers transporting young and old alike on this unique Los Angeles attraction. They also represent another advancement of the replica in the railway preservation field, and I expect we'll see more projects of this type in the future. The cars have hopefully shown the potential of how effectively modern equipment and historical accuracy can be combined in a replica vehicle. Who knows, some day, decades from now, they may end up in a railway museum! The Downtown San Pedro station is right at the doorstep of the Los Angeles Maritime Museum. Today's station also sits on the site of the former Pacific Electric San Pedro depot, which was demolished in 1961. If your travels take you to Southern California, add the Waterfront Red Car Line to your list of places to visit. The line is now open for business every Friday, Saturday, Sunday and Monday from 10 am to 6pm. Fare is $1 for an all-day pass. Additional information about the project is available at www.railwaypreservation.com.